Blog Summer is Coming... but it's not all about the beaches! Summer is Coming… but it’s not all about the beaches! Mining is an important part of Cornish Heritage, recently popularised in the hit TV show Poldark. Geevor Tin Mine at Pendeen gives you the chance to see what mining was like in days gone by. Geevor tells the story of the mine, the people and the landscape, and gives you a real taste of what a miner’s daily work life was like. Starting in the Dry where miners changed into their underground clothes, you can walk down the shaftband and discover how good the first aid and rescue teams were. Finally, travel back through the 18th Century to see what the conditions were like for early miners. There are also lots of other things to do and explore at this Cornish Mining World Heritage Site too. We can never quite decide, but whatever you think of the art, a visit the Tate St Ives is always a great experience. After being closed last year to expand the gallery you can now see, for the first time, dedicated spaces exploring the history of modern art in St Ives, giving key artists a permanent presence in the town where they lived and worked. The new display follows those artists across the 20th century, revealing their relationships to international art histories. From the unique perspective of St Ives, visitors can bridge geographical and chronological boundaries and discover new connections through familiar artists. National and international figures relating to the practice of modern British art in the town are covered in depth – from Ben Nicholson, Peter Lanyon and Barbara Hepworth to Piet Mondrian, Naum Gabo and Paule Vézelay. Their links to the wider story of British art are also revealed, such as the work of Keith Vaughan, who joined Patrick Heron’s Space in Colour exhibition in the early 1950s and later came to St Ives. If after a tour of all this you still can’t find something to love then go upstairs to the cafe which has fabulous views over the rooftops of St Ives to the beaches. Also consider getting a joint ticket and visiting the Barbara Hepworth Museum and the Leach Pottery on the same day. Our favourite exhibition at the Royal Cornwall Museum in Truro is ‘Cornish History and Archeology’. It has everything from Bronze Age Cornish Gold, to Roman forts, to artefacts showing industrial growth and Cornwall’s mining heritage. Don’t miss Richard Lander’s medicine chest – absolutely fascinating! The collections contain items of local, national and international importance, and many are of outstanding cultural significance. Among other exhibitions there is also a collection of Decorative Art spanning seven centuries. The collection showcases the artistry, tastes and techniques of many of the world’s leading cultures and contains an exquisite collection of ceramics, silver, glass and furniture. Also fascinating is the Telegraph Museum at Porthcurno. Porthcurno’s golden sandy beach and azure blue waters hide an amazing secret. Right beneath your feet, messages from all corners of the globe have been buzzing through undersea cables since 1870, making Porthcurno one of the most connected places on the planet and a hub of global communications to this very day. We can guarantee you will enjoy discovering this hidden history and you will leave feeling surprised and amazed. This small museum manages to bring the communication story to life in a fun and engaging way. You can explore the underground World War 2 tunnels and experience the sights and sounds of a working telegraph station. After you’ve finished exploring the museum you might just have to visit one of Cornwall’s most beautiful beaches – so take your swimmers and beach towels with you to Porthcurno – even if it’s just for a gentle paddle! St Mawes Castle is among the best-preserved of Henry VIII’s coastal artillery fortresses, and is the most elaborately decorated of them all. One of the chain of forts built between 1539 and 1545 to counter an invasion threat from Catholic France and Spain, it guarded the important anchorage of Carrick Roads, sharing the task with Pendennis Castle on the other side of the Fal estuary. A charming clover-leaf shape originally surrounded by octagonal outer defences, St Mawes was designed to mount heavy ‘ship-sinking’ guns. But particular care was also taken with its embellishment, and it is still bedecked with carved Latin inscriptions in praise of King’s Henry VIII and his son Edward VI. It owes its fine preservation to the fact that, unlike Pendennis Castle, it was little developed after its completion. 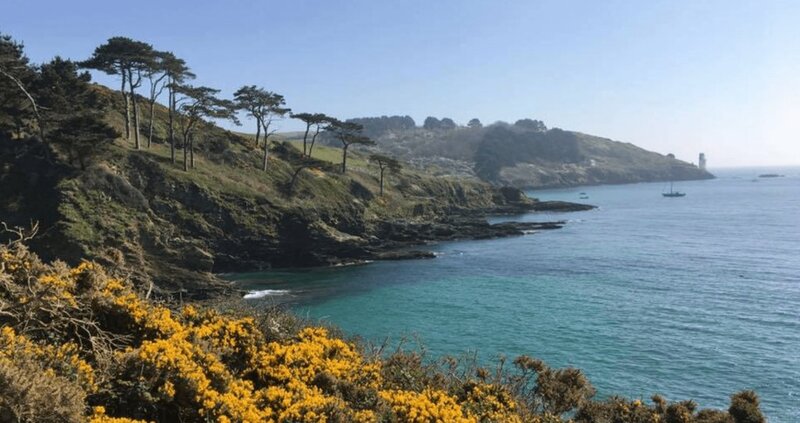 You can explore the grounds which stretch down to the waters of the Fal Estuary and enjoy the stunning views across to Pendennis Castle and out to sea. There are often cruise ships and other vessels which pass through this busy shipping lane. During the summer there are often outdoor theatre productions so that you be entertained in the beautiful surroundings of the grounds with the castle keep in the background. Don’t miss the the ‘gunners’ at rest in the gun room, the stunning sea views from the top of the castle keep and the oubliette where prisoners were kept captive. Check before you go as the castle is very popular for weddings in the summer so can be closed to the public. Best of all you can walk to the Castle from Roundhouse Barns. A couple of hours of gentle strolling along the river Fal will bring you to the castle. Then it’s a short walk downhill to the centre of St Mawes, where plenty of cafes, pubs and restaurants, almost all with a sea view, await you. These are just a few of Cornwall’s many attractions and you can visit as many or as few as you like if you stay with us. Your five star luxury cottage will await your return and the courtyard garden will beckon you to sit outside and enjoy a thirst quenching cuppa (of Cornish Tea of course), a cooling gin and tonic or maybe your free bottle of champagne! Yes, we are offering a free bottle of champagne and a punnet of fresh strawberries to anyone who books a week’s stay with us in July or August. Oh, and if you really want to know our favourite summer beaches you’ll have to wait for the next blog!